Look at these pictures! In the metal bin is one week’s worth of rubbish for landfill in a black bag – a fraction of the amount we usually collect over the space of one week. In the green bag are two week’s worth of plastic, tin and foil for recycling (sporting our last two bottles of shampoo… bye bye liquid shampoo and hello shampoo soap bars). We literally stood staring into the bin when it dawned on us that the landfill rubbish we collect is dramatically shrinking. It was the most gratifying feeling and has really boosted our motivation. It’s no wonder really when you consider that most of our family shopping is now wrapped in paper bags, or in glass jars, bottles, tins and in our own containers that we take to shops. Our grocery shopping looks quite pretty now I think. Not surprisingly it is also cheaper than buying pre-packed items and there is less food wasted as we only buy small amounts at a time. Gone are the days of bags of pre-washed salad turning to slime in our fridge. I read that 30% of Tesco lettuce is discarded in the process of producing the bagged kind and that the majority of bought lettuce bags are thrown away before they’ve been used up because they sit in our fridges for too long. That is a lot of wasted food and packaging going straight into landfill. 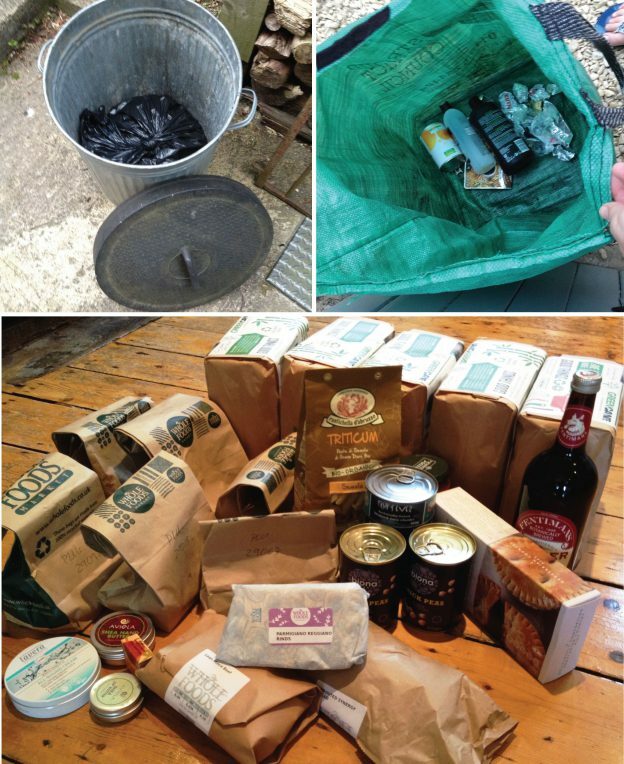 I can’t wait for November when Stroud Council is introducing cooked food waste collection. We put our kitchen scraps on the compost heap but I don’t like putting cooked food on there. Next step: finding an alternative to black bin bags. We thought we might ask the farmer next door if they would let us have the paper bags of animal feed when they are done with them. I wonder whether we can persuade the rubbish collectors to stop throwing black plastic bags on the drive with each collection? This entry was posted in General, Getting started, Recycling and tagged mindful living, reduce waste, reduce your garbabge, unpackaged food, unpackaged shopping, unwrapped, zero waste on June 10, 2016 by admin. Hi, I am looking for advice regarding alternatives to the black plastic bags for general waste. Thank you.